Limits are an illusion: a revolutionary account of the science and psychology of endurance, revealing the secrets of reaching the hidden extra potential within us all. The capacity to endure is the key trait that underlies great performance in virtually every field. But what if we all can go farther, push harder, and achieve more than we think we’re capable of? 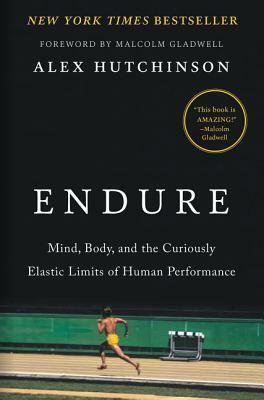 Blending cutting-edge science and gripping storytelling in the spirit of Malcolm Gladwell—who contributes the book’s foreword—award-winning journalist Alex Hutchinson reveals that a wave of paradigm-altering research over the past decade suggests the seemingly physical barriers you encounter as set as much by your brain as by your body. This means the mind is the new frontier of endurance—and that the horizons of performance are much more elastic than we once thought. But, of course, it’s not “all in your head.” For each of the physical limits that Hutchinson explores—pain, muscle, oxygen, heat, thirst, fuel—he carefully disentangles the delicate interplay of mind and body by telling the riveting stories of men and women who’ve pushed their own limits in extraordinary ways. The longtime “Sweat Science” columnist for Outside and Runner’s World, Hutchinson, a former national-team long-distance runner and Cambridge-trained physicist, was one of only two reporters granted access to Nike’s top-secret training project to break the two-hour marathon barrier, an extreme quest he traces throughout the book. But the lessons he draws from shadowing elite athletes and from traveling to high-tech labs around the world are surprisingly universal. Endurance, Hutchinson writes, is “the struggle to continue against a mounting desire to stop”—and we’re always capable of pushing a little farther. Alex Hutchinson, Ph.D., is a columnist for Outside magazine and was a long-time columnist for Runner's World. A National Magazine Award winner, he is a regular contributor to The New Yorker online, pens the weekly "Jockology" column in the Toronto Globe and Mail, and writes for the New York Times. FiveThirtyEight recently named him one of their "favorite running science geeks." He was a two-time finalist in the 1,500 meters at the Canadian Olympic Trials, and represented Canada internationally in track, cross-country, road racing, and mountain running competitions. He holds a Ph.D. in physics from the University of Cambridge, and has worked as a researcher for the U.S. National Security Agency. He lives in Toronto, Canada.